About a month ago, I returned from a three-week trip to Europe. For the past three years, I have been taking an annual journey to southern France in order to reconnect to my roots—at least some of them, which are calling me vividly. 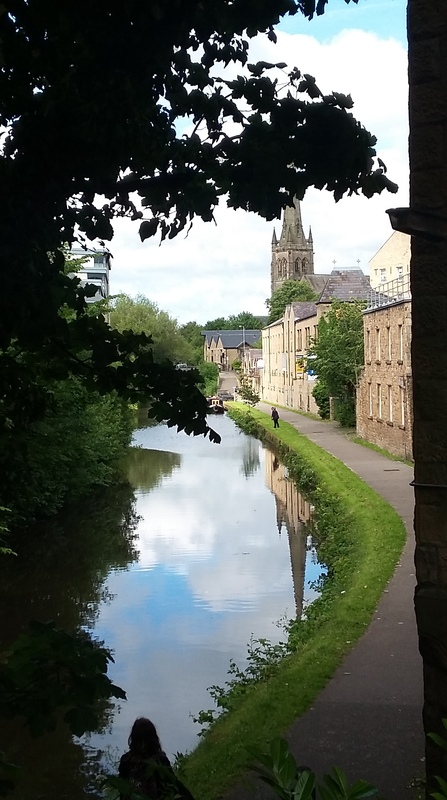 This year was no exception, and yet I added an English piece to the European menu, visiting the city of Lancaster in northern England for two days. This is a place that has been calling me for some time and whose name showed up in a dream in January of 2015. I was on my way to India in the dream and somehow did a layover in Lancaster. 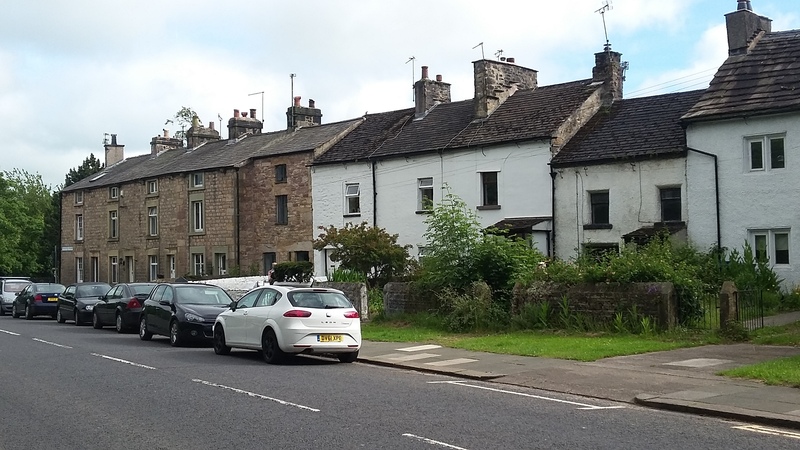 Why Lancaster out of so many ‘layover possibilities’? What was the dream telling me? 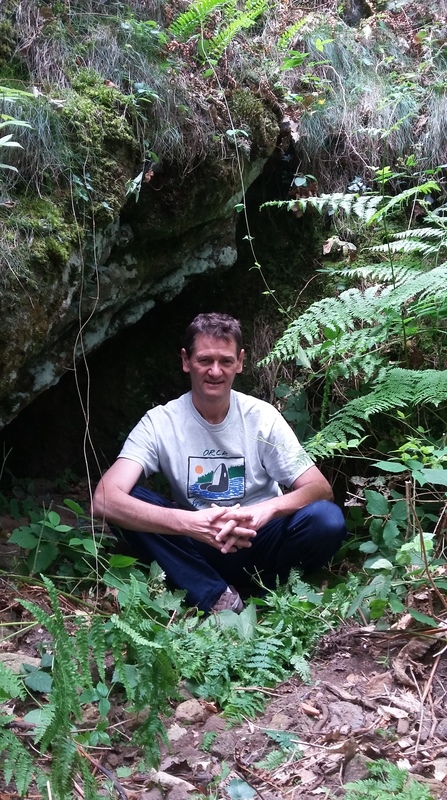 All in all, this European adventure has been an eventful ‘opportunity’ to grow, especially in France where Valeria and I hosted a retreat at a delightful place called Les Labadous. 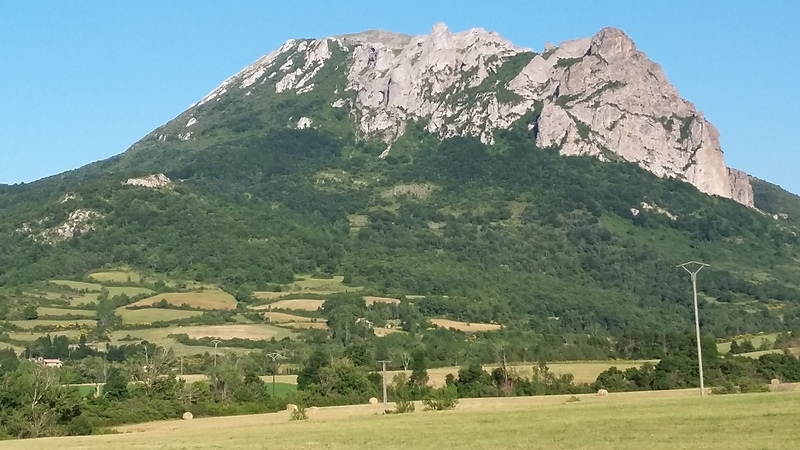 An eight-day retreat entitled Walking the Sacredness of our Lives, A Call for Reconciliation—Inner and Outer, which was a combination of some on-site ‘work’ and visits to sacred and inspiring sites or monuments in the province of Occitania; or even further away in the region of Provence, with two Mary Magdalene footprint sites. What bubbled up to the surface toward the end of this journey, on June 29th, was a genuine sense of completion; a feeling of completing a loop that had started 10 months earlier when Valeria, her family and I, happened to visit ‘by accident’ a beautiful church in the ancient town of Mirepoix. 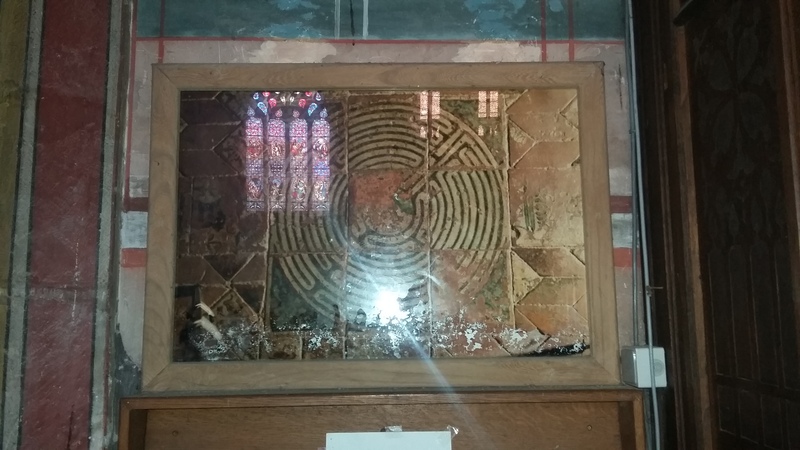 There we saw an unusual labyrinth, framed and posted on the wall. This was in August of 2016. Once I found myself in this peaceful building again, I understood right away that something was closing in, and that we were coming out of the circuitous path we had entered a few months prior. What stood in between was, besides a strong message to recreate community, an unconscious voyage that brought us back to where we had sown our first seeds. This journey into both the physical, the geographical on one end and the unconscious, the etheric on the other was sprinkled with many questions that spiced up our adventure; or rather my adventure, to be honest. This question was synchronistic, knowing the primary goal of our trip to England was to visit an area of Lancaster called Golgotha Village; a place that was initially composed of 22 attached houses; a row of ten white houses remains, along with two larger houses on the north end, and further away, an old cemetery which is said to be a Quaker cemetery—a locale that had been calling me, and that still calls me, for whatever spiritual reason. I believe I visited that area in the year 84 CE as Caleb, son of Lazarus, coming all the way from Cyprus, in search of some revelations, and trying to establish connections with like-minded gnosis-oriented brothers and sisters. A pilgrimage of some sort. Golgotha Village was a mystical place that apparently didn’t deliver what I was searching for; yet it left a strong imprint in my psyche, to the point I was drawn to visit it again twenty centuries later. During the first day we spent there, enjoying the beautiful setting of the Toll House Inn near the main canal, I saw a moored barge named “Second Chance.” Perhaps it was a chance for me to accomplish what I meant to do long ago; perhaps it was not? The mystery remains whole, yet the sign, the divine wink on the water, is incredibly titillating, knowing our eyes usually catch a glimpse of what we are meant to see. So often we accomplish deeds whose consequences we are not aware of. 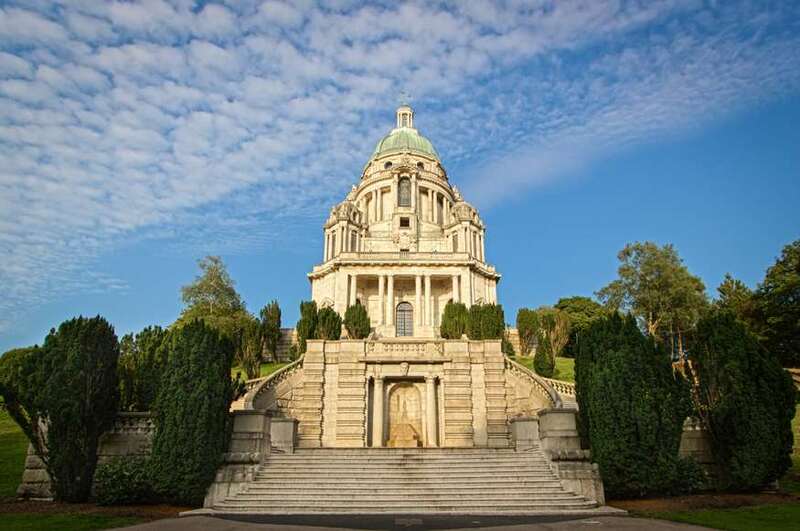 Besides visiting the castle on the second day, the highlight of our stay was a clearing in a large park (Williamson Park) overseeing the town and the Morecambe Bay. In this park, there is a memorial dedicated to the second wife of Lord Ashton, and slightly to the east, a round building called the Temple Shelter. This is the area we chose to conduct a clearing of the old and dark energies. A lot of ‘dark incidents’ happened in Lancaster over the centuries, between fifteen Catholic martyrs being executed, witches being burned in the year 1612, after spending some time in a dungeon of the castle, Roman invasion, looting and destruction toward the end of the first century, the “Black Death” of 1349; the list goes on and on. Magpie is an animal that comes into our lives to tell us that it’s okay to have irrational fears. Magpies help us confront that which we irrationally fear, and does so in a gentle and compassionate manner. Magpies, with their dualism of color and representation in culture as both a good and bad omen, represent duality and binary opposites. The specific focus on this duality tends to be on reconciliation of emotional or spiritual opposites. It is time to balance opposing emotions, like anger and compassion, or spiritual opposites, like the mysteries of life and death. When magpies come into your life, chances are that there are a few wights (spirits) in your life as well. Magpies represent wight-attraction and might imply a time in your life when you might be more obsessed with faeries and goblins, or unicorns and dragons; far more than usual. Now that I look back at what I wrote, I realize that yes, the energy of the magpies transported us during our retreat in the south of France, with some moments more peculiar and salty than others—as it always happens when a group of fellow human beings comes together. What felt meaningful and complete about this journey to Lancaster was to bury a little energized crystal in the Quaker cemetery, which apparently became Quaker some three centuries after the Black Death of 1349 I mentioned above. 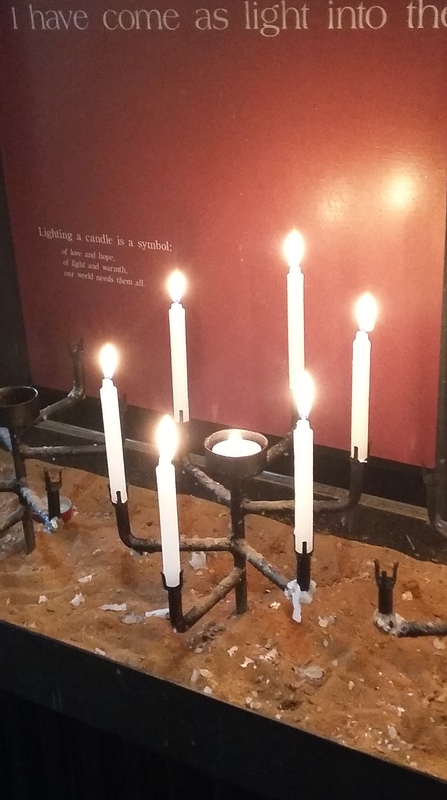 It is part of Golgotha Village, possibly the most mystical area, and this is where I wanted to leave a piece of Light for whomever may find it during her or his search. May it enliven and purify the area and the town of Lancaster for the years and millennia to come! It is very challenging to sum up what happened during this eight-day retreat where seven people came together to weave and reweave relationships, both consciously and unconsciously. There was definitely a link between us before we met, and yet so much more was unearthed and reawaken during our time together. Knowing many of us, if not all, connected at some point with this area in the south of France that has witnessed so much horror, bloodshed, and destruction. We didn’t purposely come to clear the energy of the land, and yet we may have helped in the process. 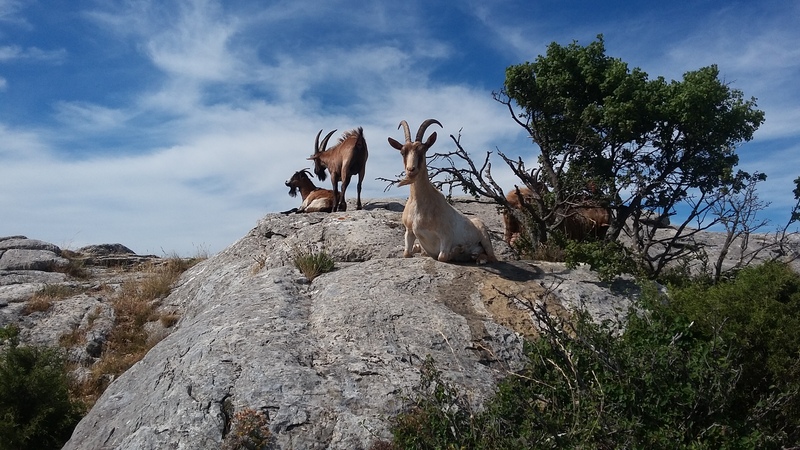 Besides a small fire ceremony in the fortified castle of Montségur on June 21st, the day of the summer solstice, we didn’t engage in any special outdoor rituals. This was, I believe, more of a personal journey, a pilgrimage if you wish, for each of us where the purpose was to see and remember; and change whatever needed to be changed in our lives. This is, obviously, my personal reflection, more than one month after the experience. This was a very concrete question, one that called for a plan of action, or some visible steps at the very least. I knew this was an ego-driven surface question, yet a necessary one in the process of diving into deeper spiritual waters. And my ego wasn’t happy with one participant’s response: “Just be!” I needed more concrete pebbles on the path, a sense of direction and a balance, as I mentioned to the group, between doing and being. I carried this question with me as we embarked on an early climb to reach the top of the castle of Montségur. 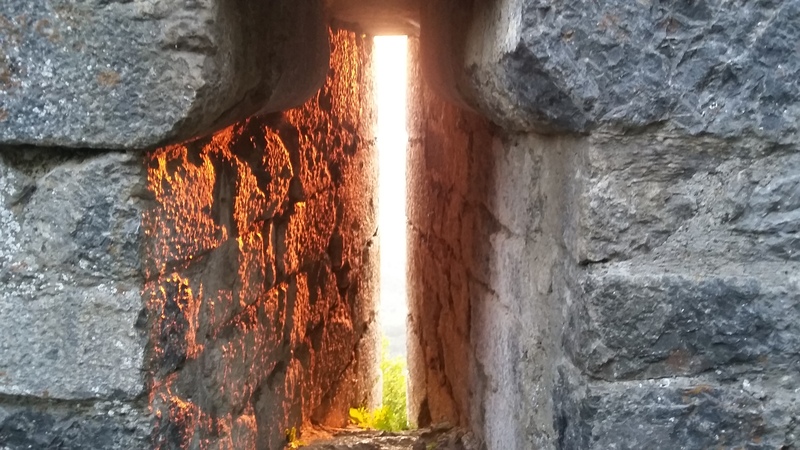 We were able to witness a special light phenomenon that occurs during the summer solstice when the sunlight shines through one of the arrow slits on the south side and reverberates on the opposite wall. The sun then goes up and illuminates another, higher piece of the remaining wall in the apartment section of the castle. It was a beautiful moment that we all enjoyed, yet no inner spiritual illumination took place and I went down the mountain with my question unanswered; even unspoiled. 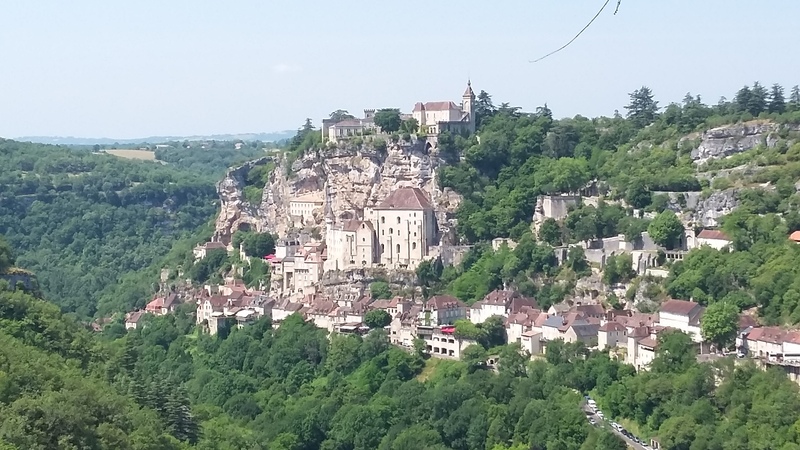 The group had expressed a desire to visit a sacred site on the next day, one that I had not contemplated: Rocamadour, in the land of Quercy. It is an unusual, high-perched village where Amadour, after traveling from Palestine to France in the first century CE, built a chapel dedicated to the Blessed Virgin. 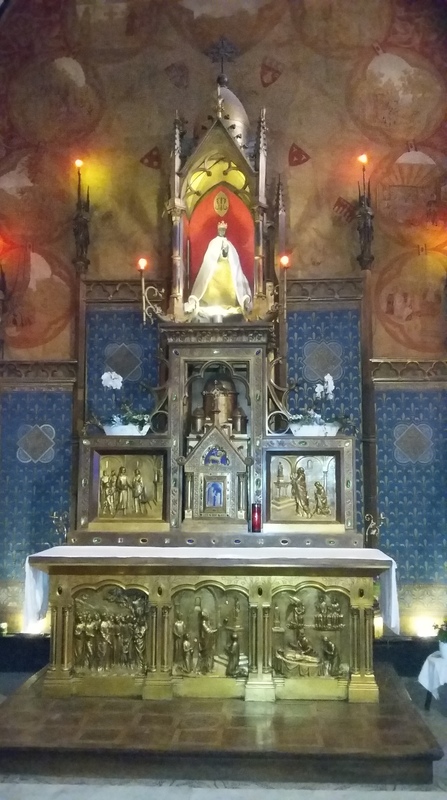 This chapel is no longer in existence and has been replaced in the 15th century by a Notre Dame church that hosts a Black Madonna, reputed to have been carved by Amadour himself. As a group, we visited the church Notre Dame, as well as the adjacent chapel, and then everyone went their own way, seeing more buildings or walking through the shopping area of the village. 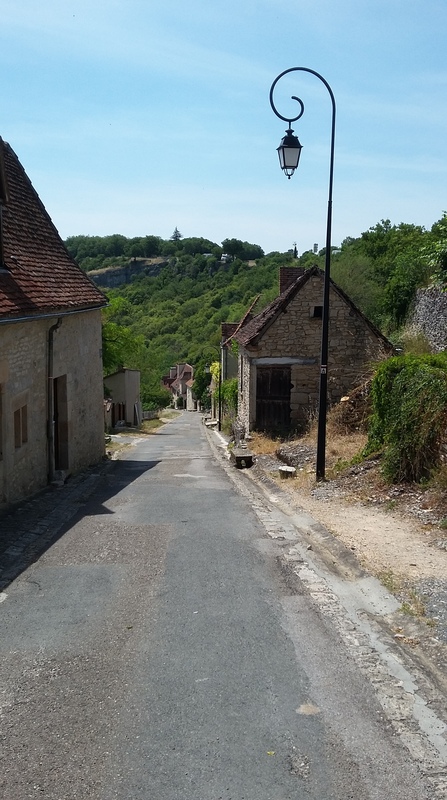 I finished my solo tour, quenched my first with an Orangina at a café, and went back to the village to join the rest of the group. We enjoyed one last drink together before boarding the little train that would bring us back to our cars. And started driving back to Les Labadous, about 3.5 hours away. This is when the bells started ringing. I was driving and the person sitting next to me started making requests that would change the remainder of our itinerary, visiting sites in Provence the following week. The first request seemed a bit unreasonable to me, forcing us to leave early that Monday morning to accommodate one person’s needs; yet a second request came, of the same nature; and then a third one, more personal. All these requests in the course of forty-five minutes. This is when the message came through, crystal clear, allowing me to realize that my “lack of assertiveness” was ringing as loud as it could—people making requests, and my not saying anything. Not only during this trip, but also as a remnant of my childhood, something I needed to address in full awareness. This is what the energy of the lady of Rocamadour facilitated and what she wanted me to realize; something I needed to change for the better, along with a few other things (guilt and fear of being scolded) that got thrown into the karmic cocktail of my life. A question I couldn’t see with my own eyes during the first few days of the retreat. This was a first, significant opening—a lifting of a thick veil, if you will. I mentioned one of the signs I received in Lancaster when I saw the “Second Chance” barge. Prior to leaving for England, there was another one, too large and too beautiful to ignore. I was at Starbucks that Sunday afternoon with my family, enjoying a small bite and a cup of hot chocolate. Next to us was a big guy working on his tablet. He was wearing a brown t-shirt; a wordless t-shirt. In the center, upper part of the t-shirt, three orange crosses; the one in the middle more prominent than the other two. A not-so-innocent sign as I was preparing myself to travel to Golgotha Village the next day. I understand that I didn’t yet answer the question that popped out early, “what does it mean to die on the cross?” To this, I would say three things: first, some questions are more personal than others and the response may take some time to trickle down; second, the logistical and material challenges we experienced during our retreat were in many ways a personal way of dying on the cross; and, finally, who knows for certain the identity of those who died on the cross that very day, and those who didn’t? The other signs that I experienced were a series of double numbers, double 15, double 17, double 19, and double 22. Why these four numbers only, always doubled? 15:15 showed up four days in a row, once a day, during the first few days; then, on Saturday, June 24th, as we traveled to the village of Peyrepetuse to see the fountain of Love, 17:17 and then 19:19; and then a few days later, as we roamed the land where Mary Magdalene lived, 22:22. This led me to search for the meaning of 15:15, knowing the number 1 relates to new beginnings, striving forward and taking advantage of new opportunities, activity AND assertiveness. Number 5 resonates with the attributes of making life choices and important changes, adaptability and versatility. That was enough to convince me that something was at work. As to the double 17 and double 19, these were signs about what we were going to discover the next day. Two English gentlemen, Peter Blake and Paul Blezard, wrote a book in 2000 entitled The Arcadian Cipher, the Quest to Crack the Code of Christianity’s Greatest Secret. It is a book that went under the radar and that very few people apparently took note of. In it, they provide ample historical research and details about the location of two tombs in the south of France, near the village of Arques, right by the Col du Paradis (the mountain pass of Paradise). The tombs of Yeshua Ben Joseph and Mary Magdalene; tombs that have been ransacked by the armies of Dagobert I, a French Merovingian King, in the seventh century. And soon after emptied by monks of the abbey of Saint Denis, north of Paris. It was one of my main purposes to see these tombs and so, early morning on the 25th of June three of us embarked on an expedition to the Col du Paradis. We parked our car at a location called l’Estagnol and continued on foot for about two kilometers. At some point, the larger dirt road veered to the left and it was necessary to go up a hill to the right, on a much smaller, yet clearly delineated, trail. And a few meters down, as Peter Blake describes (he’s been there on his own, at least twice), a large erected stone that signals an escarpment; and about ten meters down the escarpment, the entrance to the first conduit that perfectly matches Peter’s account. 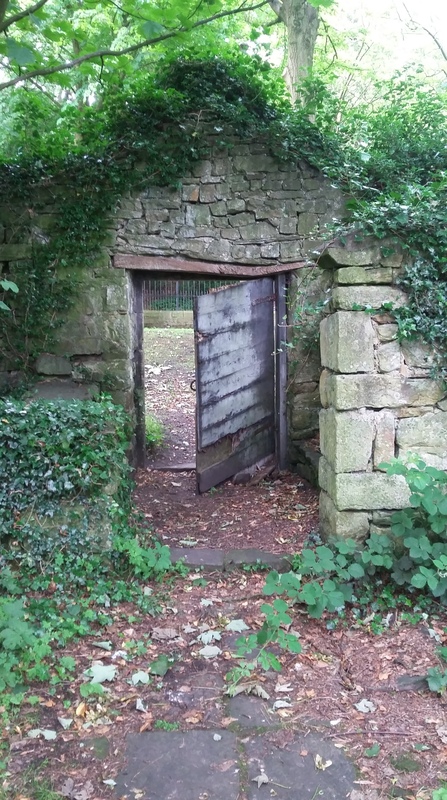 And then a second, smaller opening corresponding to the second tomb. It was truly a moment of completion, of seeing for ourselves what might have been—and most likely remains—a very sacred place. 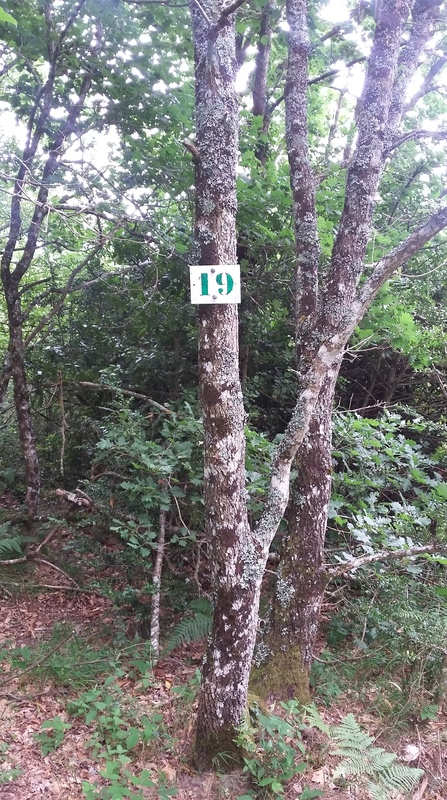 On the way back to the car, I noticed posted signs with numbers. First, going forward toward the tombs, I noticed a first 17, in green letters; then a second 17; then a first 19, and then, right across from the erected stone that signals the sacred location, a second 19. Guided by the Divine, were we? And yet I couldn’t figure the day before that these two double numbers would be the clues leading to the result of our inquiry. So seldom do we realize what is leading us, yet the Divine, in its own ways, knows how to communicate—quite subtly at times. Before a final 15:15 during the flight home as the passenger in front of me went to the restrooms and paused the movie he was watching. Too mystical to be true, till the very end of the journey. To conclude this story of our journey into inner lands and landscapes, I would like to share a bit of what happened since I came back home. It usually doesn’t take me 30 days to write an account of what I experienced and yet, this time, life’s speed increased to the point I had to postpone a few things. Till today, that is. What I want to talk about is the practice of SURRENDER. 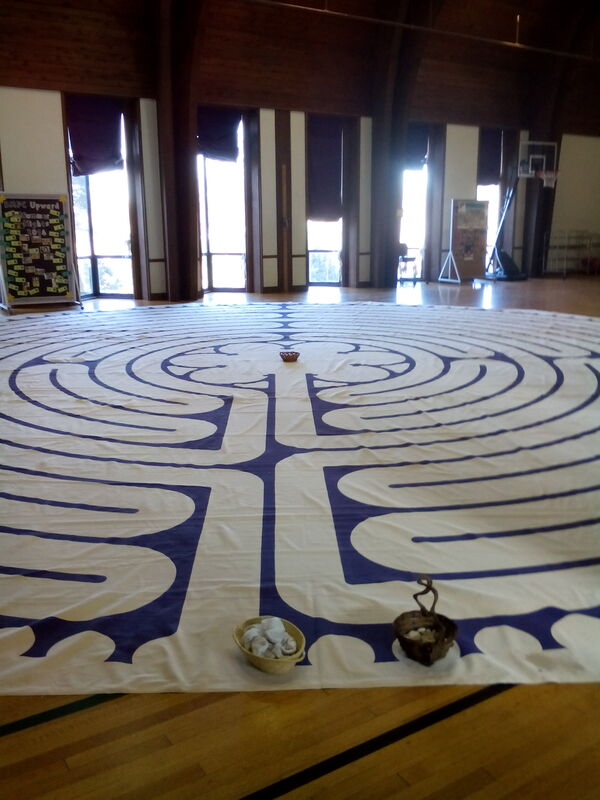 Our journey at Les Labadous was built around and upon the metaphor of the labyrinth—the one we were walking unbeknownst to us, and also the one that does exist in so many sacred places. 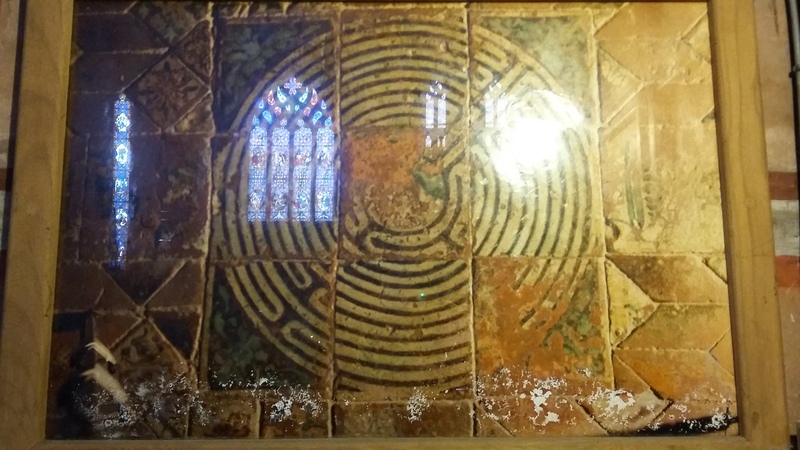 I am talking here about the 11-circuit Chartres type of labyrinth. Please take a moment to locate one and walk it for yourself if you’ve never had the opportunity to do so. The center of the labyrinth is composed of six petals, which are considered from left to right, as we enter this center. 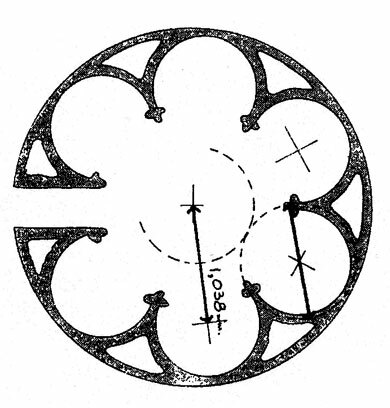 What I didn’t know until I read a book by Kathleen McGowan (The Book of Love) is that the center of the labyrinth is related to the Pater Noster prayer and that each of these six petals, as explained below in the document Praying in the Center of Labyrinth, correlates with one section of the prayer. Each day during the retreat, we read the Pater Noster together, and listened to a prayer dedicated to Mary Magdalene. The day after we visited Rocamadour, we also considered the different petals, and the importance they carried in our lives, praying in those where our attention was most needed. FAITH, SURRENDER, SERVICE, ABUNDANCE, FORGIVENESS, STRENGTH. It is remarkable how this practice of Surrender brought a fresh perspective in my life, surrendering to ‘things’ that used to provoke irritation and sometimes anger in me. Examples are numerous and change is very noticeable, palpable, down to the swimming pool where our son takes his group swimming lessons four times a week. What I wanted to share further is what I understand by surrender. At the end of World War II, Germany and Japan surrendered. They ceased to fight. In many ways, they had no other choice because their back was against the wall. This is my feeling about my surrender; I needed to “cease fighting”; more specifically those ‘things’ that I had been fighting with my ego mind, therefore creating more space within me, so that peace and light can find a haven and be sent out to the world around me. This has been a deep realization as I now start to fully understand the ripple effects of the transformation that I went through in the south of France, and that I set forth in Golgotha Village; I can proudly declare that yes, “a something did die on the cross.” A veil, an inner shroud, a plain something that prevented me from seeing. Love & so much Light, dear Ones! Your names are hallowed and sacred. Contemplate here your faith in the Lord your God and the grace of the Holy Spirit, while giving gratitude for the presence of both in your life and on earth. Listen to the voice of your Father that you hear his will and carry it out without fear or fail. Stay in this petal for as long as it takes you to submerge yourself and find the blessed release of surrender to his will rather than your own. Here you will reaffirm your promise, to God and to yourself, if you are fully anthropos [fully realized being] and have remembered it. If you have not yet reached the state of realization, you will confirm your commitment to create heaven on earth by acting in accordance with the Way of Love, by loving the Lord thy God above all else, and by loving your brothers and sisters on earth as yourself, for they are part of yourself. You will pray then for enlightenment that through gnosis you will remember the nature of your own eternal promise. Give us this day our daily bread, the manna. Give thanks to the Lord for all he has provided you and know that when you live in harmony with his will, and honor your promise to his service, you will know the bounty of abundance and never have a day of want. There is nothing that you need or desire that will not be provided you when you live in the flow of God’s grace, and you have aligned yourself with God’s will. As we forgive ourselves and all others. Here you must list those who have harmed you, who have given ill witness against you, or who have otherwise caused you pain. And you must forgive them, while praying that they will one day be fully anthropos and realize their own connection to God and remember their own promise. You must ask that anyone you have offended forgive you in the same way and, most of all, you must forgive yourself for all the actions and thoughts that have brought shame upon you in your human weaknesses. For while all forgiveness is the balm of our compassionate Mother, self-forgiveness is needed most of all. Deliver me from the temptation of evil. For temptation is that which keeps us from becoming fully realized beings. It prevents us from keeping our promise to God and to ourselves and to each other, and is found through the temptation of avarice, hubris, sloth, lust, wrath, gluttony and envy most of all. Contemplate these sins and pray for your release from any that tempt you from the path of the anthropos. Pray in this manner that I have given you and teach your brothers and sisters in spirit to do the same. It is through living this prayer that men and women will create heaven on earth. It is through this prayer that they will live as love expressed. This entry was posted in My Personal Path and tagged enlightenment, illumination, life light love, Mary Magdalene, search for the Divine, south of france, Transformation. Bookmark the permalink.